The BI Content Assistant is a business objects backup tool to assist in the hot backup, restore, movement and management of BOXI/BI4 content, currently documents and universes. 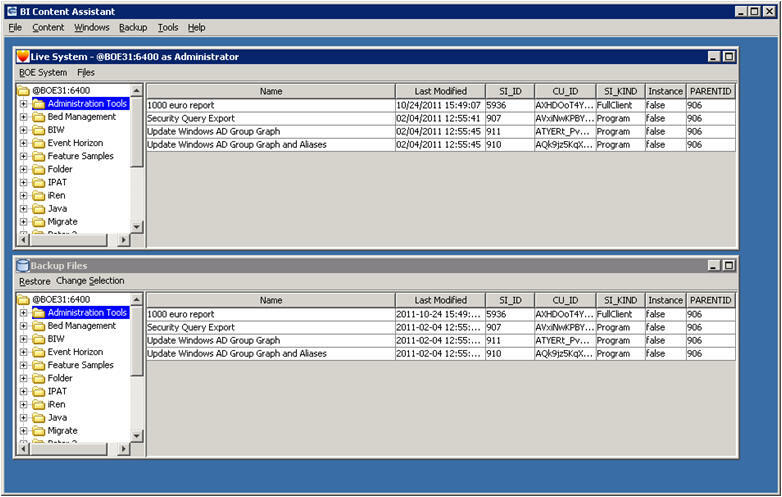 Backup interactively or by a scheduled BOE job. Import and export documents to the operating system folders. Easy install and maintenance, set up and forget. The title best describes how we use BI Content assistant for our BI platform. We take incremental backups of our 3 clusters around the globe multiple times a day and this allows us to go back to any point in time for individual documents. Something we cannot do in an easy way with the stock BI Suite.